Nintendo's handheld is a fantastic gaming device. So if you're thinking of buying someone more games for their 3DS, or a 3DS itself, here's a little advice. DO buy a 3DS if your friend/significant other/mom doesn't already own one. Chances are there's something to be found on the platform that they'd enjoy. Especially with recent new additions of the latest Zelda and Pokémon games, it's hard to live without Nintendo's most successful piece of hardware. Plus, it can play all of the DS's games, too. And if you are considering getting someone a 3DS, definitely go for the XL size. The bigger screen is well worth it. DO buy Pokémon X or Y—they're the best Pokémon games in the franchise, and a good starting point for newbies, too. With over 700 creatures to capture, train and play with, it's hard not to be charmed by this RPG adventure. Plus, it lets you dress up and explore its own version of Paris—Eiffel Tower and all—while riding roller skates. Yes. DO buy The Legend of Zelda: A Link Between Worlds, because, wow, that's one good Zelda game. It's a sequel to the Super Nintendo's A Link To The Past, a throwback to old-school top-down Zelda-ing. But it's also a progressive Zelda that shakes up the series' formula by freeing you to do more things in the order of your choosing. And then there's the soundtrack. Incredible. Give this game to anyone you like. Withhold this game from anyone you hate. DO buy Animal Crossing: New Leaf, a lifestyle more than a game and something that you can check in on every so often. Any kind of gamer—and non-gamer!—can find enjoyment in their mayorship. Or pick up Mario & Luigi: Dream Team. It's the year of Luigi, after all, and this portable entry puts the skinny Mario brother in a hilarious, trippy action/RPG romp. Really, just buy any of these 3DS games. DO gift a digital copy of Phoenix Wright: Dual Destinies, a wonderful, story-heavy game about a goofy lawyer and his band of peppy subordinates. Ignore the M rating—there's some blood, and some murder, yes, but anyone can enjoy this game. DO get a pack of those colorful stylus pens if you're looking for a cheap gift for an acquaintance. They're definitely not the best quality, but it's fun to switch up the colors every so often. And, hey, you were the one looking for a low-cost gift! DO buy a 32GB SD card for 3DS owners. It'll let them store a ton of downloadable games on their system without every having to swap out a cartridge or worry about storage overhead. Plus, they're easy to find and pretty inexpensive! DO get headphones as a stocking stuffer. Portable gaming is better if you can hear it, and the 3DS' speakers aren't up to the task. Headphones, even basic earbuds, are. DON'T get the 2DS unless you're strapped for cash. 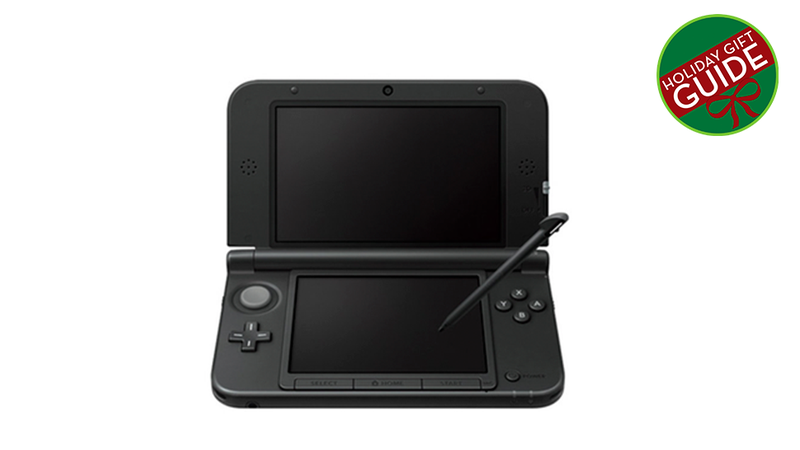 The 3DS' clamshell design makes it easier to carry around. And if you're worried about the 3D effects on younger players' eyes, you can just turn them off. But if money is limited, and it's 2DS or nothing, grab a 2DS. It plays all 3DS games, and the 3DS has a ton of great games. Feel free to drop your own suggestions down below.